Explanation: This image is part of the first color panoramic view from Venus. 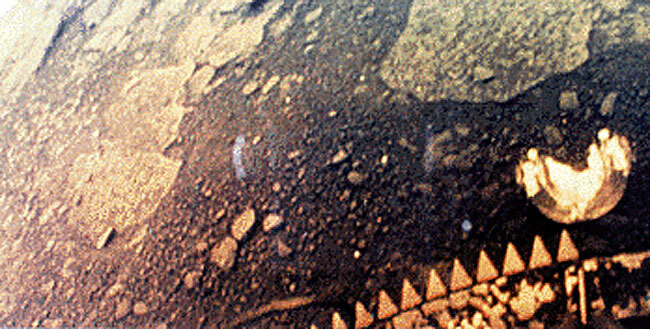 A TV camera on the Soviet Venera 13 lander that parachuted to the surface on 1982 March 1 transmitted it. Venus' clouds are composed of sulfuric acid droplets while its surface temperature is about 482 degrees Celsius at an atmospheric pressure of 92 times that of sea-level on Earth. Despite these harsh conditions, the Venera 13 lander survived long enough to send back a series of images and perform an analysis of the Venusian soil. Part of the lander itself is visible in the lower right portion of the image. An earlier Soviet Venus lander, Venera 7 (1970), was the first spacecraft to return data from the surface of another planet.